Just had the OBD-II codes read on my 1997 626ES. It came up with "P0400 Exhaust Gas Recirculation Flow Malfunction". Does this mean that all I need to do is replace the EGR valve and all will be well again? Is it possible for something else to be causing this fault code (a sensor, switch, etc.)? Has anyone replaced the EGR valve on this car? Easy? DIY instructions somewhere? 2 small ports at the bottom, these are your egr ports that go through the intake down to your valve. You have to un-bolt your EGR valve, i know its hard to get to on a V6 but just work with it. Get yourself a can of Carb cleaner with a straw and spray into the ports at the top, and see if it comes out the bottom where the valve is, if it doesn't then they are clogged. If you don't have compressed air handy, let it soak and hopefully it will break the carbon loose in the passages. I would try this first and see if the light comes back on. Same thing for the 4 cyl. If the light does come back on, make sure that the solenoid to the boost sensor is good and that the vacuum lines aren't cracked, if the solenoid isn't opening to allow the boost sesnor see the diff. in the intake when the egr is opened, it will assume that the valve did not open and set a DTC. 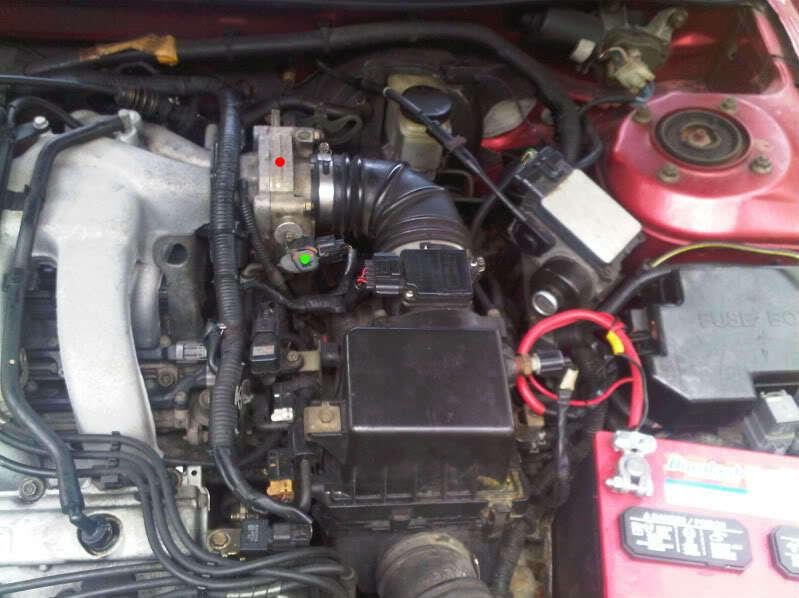 I have 2000 mazda 626 engine 2.5L, and have the same code p0400 EGR flow malfunction. I remove the throttle body and put it aside. Then, I clean 2 small ports as you said. I also remove the solenoids on the top of the EGR valve (holding by 4 phillip screws). Then, I push EGR valve down opened, and use compress air to blow through the 2 ports, air will come out the tail pipe.Then , I do a reverse air flow from the tail pipe to the 2 ports (while holding EGR valve opened), all ports are clear. I'm completely new at this and don't even know where the throttle body is is it in the left or right side of the engine and if possible could someone post a picture of it. when you open the hood its to your right of the engine. Not to worry Rey as many here can attest even I didn't know much not too long ago. Just depends on how much you want to learn. I plan on eventually making a primer or intro to the 626 video that goes over a lot of common locations so you and others can get to know your cars better. You are not alone. There are many people that don't know where the EGR, TPS, water pump, and so on are located. I'll make a video that goes over everything in the engine bay. I'm not doing much tomorrow. Keep an eye out for it. (Code PO400) I having the same problem. 2000 Mazda 626 2.5 V6. I changed out the EGR valve and cleaned out EGR tube before and after valve. Could be a clog in the EGR pipe, faulty EGR solenoid, or if applicable a faulty EGR position sensor. Not sure if the 5th gen 2.5 has a position sensor on the EGR. Well , know the egr tube is clear. I took the 4 screws off of the back of the egr valve and revved up the motor to see if it would engage, but no luck. I'm assuming the vehicle have to be drive and doing at least 50 mph or be on a left., possibly? Yeah that's no way to test the EGR. You'll need to get a hold of the diagnostic procedures for your year. Sorry I do not have them. Yes but did you clean the EGR Port(s) inside the intake (behind the TB) it's no bigger than your baby finger and it can get clogged solid...you need to run a stiff wire thru it and lots of TB cleaner! 97Mazda is dead on. I use a pick tool, throttle body cleaner, and sometimes pipe cleaners or little bottle brushes work well. I have a video but it's for my 4th gen. The EGR system is almost exactly the same (minor differences) so you can use that to get a sense of what might be needed. If you've cleaned the EGR valve next you'll want to get at the EGR exit port inside the intake manifold. Throttle body will have to come off for that. If you have an EGR clog that is the most likely candidate for it as that's the smallest diameter in the entire EGR system other than inside the EGR valve. This isn't to say that something else couldn't be causing it like a bad sensor. That's entirely possible but you'll want to make sure your EGR pipes and cavities in the intake manifold are clean too. Yes too many people assume the EGR is bad and go and waste money on a new one....from my years of experience the P0400 code is almost always a plugged port in the intake! Not sure about the 2000 but I know my 97 shares the same port as the PCV valve...thus the common P0400 which is basically "EGR low flow/no flow" ! I'm new here. I have a 1999 626 V-6 with the all too common p0400 code. I checked all vacuum lines for leaks or cracks and all are ok. I have not checked the boost solenoid or EGR yet as I am just starting this diagnosis. I did read some posts here about cleaning the EGR ports and I attempted to clean them, but first I have some questions: I removed the 2 throttle body retaining bolts and 2 nuts, separated and removed the TB from the intake manifold (IM). Are the EGR ports the two small holes on the bottom, just inside the IM ( these holes are about the size of a pencil)? If so, I don't know how these holes are rounted to the EGR or end up at the EGR valve. The EGR valve is mounted on the bottom of the rear cylinder head, not on the IM. The IM simply sits suspended over this cylinder head, it's not connected to it anywhere. Also, when I look at the opening of the IM, just behind the TB, the two small holes in question seem to go straight down into a cavity which is sealed at the bottom. Can anyone here post pictures of what I'm supposed to be looking at and maybe explain a little better how to clean the ports and what tool to use, other than just saying use a stiff wire? This is a big help but I'm not out of the woods yet. I have the TB off and see the 2 holes. Someone mentioned removing the 4 screws on top of the EGR valve. This doesn't gain access to the 'port'. At best, I can feel one bolt under the EGR valve, the other I can see but looks like it holds a bracket. Any chance someone has a view of this or can explain how to remove the valve? I looked for a downloadable manual but nothing for this engine... Any help is greatly appreciated. Well...the issue is fixed. It turns out when I re-installed the intake manifold, a small piece of plastic from a wire terminal was wedge under the manifold, so it developed a smalll vacuum leak. After looking around one afternoon all over the top of the engine with the engine idling, I heard the faint hiss. I loosened the intake manifold, removed the plastic, then retorqued the IM; I started the car and test drove it; I did notice that the car ran a lot better, but I was sure it would not cure the P0400 code because I thought it was too simple of a repair. After driving the car for a couple days, the CEL went away!